I did a little just-for-fun sewing this week. After working on some larger and more time consuming projects, it was really nice to work on a quicker project. It feels good to start and finish a project within a day or two! 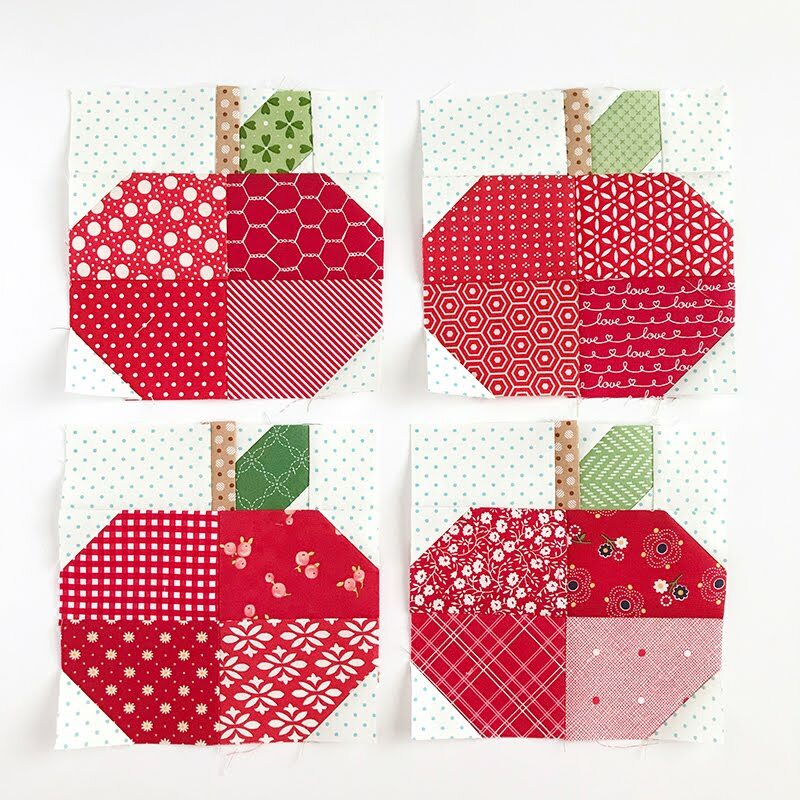 This is Scrappy Apples - a little mini quilt that I made for my wall (15" x 15"). 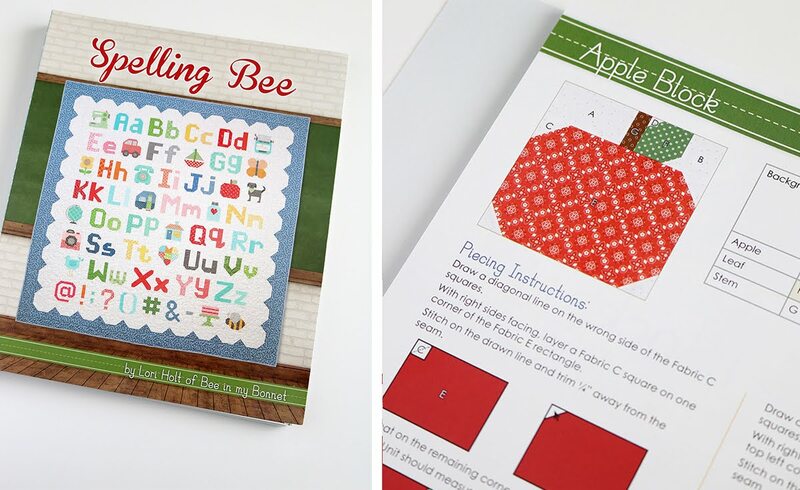 I spotted a little apple block in the Spelling Bee book by Lori Holt and I thought it would make a great mini quilt. 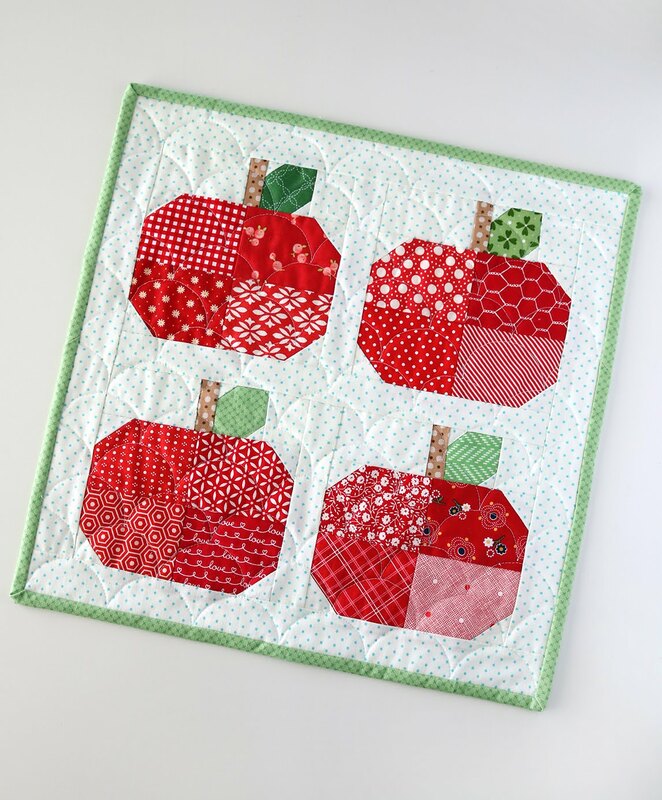 I usually struggle deciding how to quilt a mini quilt and this was the case again with the mini apples. 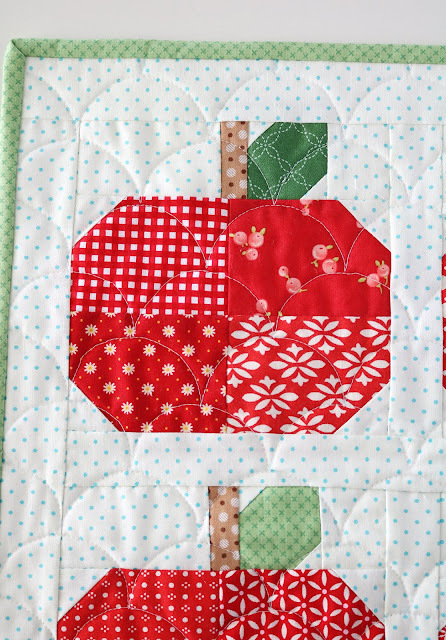 I didn't want the quilting to overpower the apples, but I wanted it to "go" with the look of the mini. 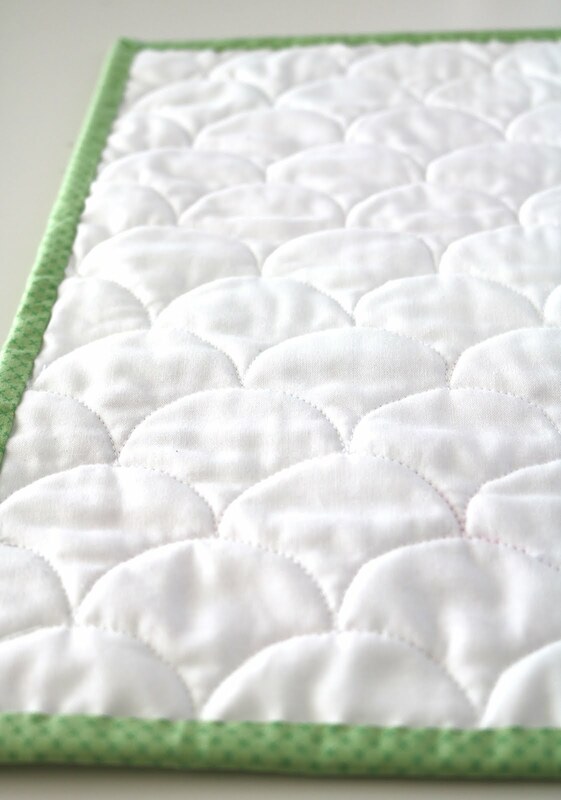 I ended up doing some small scalloped quilting (a.k.a. clam shell quilting). I found a small circle template that was the perfect size! It was one of the Sew Simple Shapes from Lori Holt. The lines on the template helped me to keep my lines of scallops straight as I went. I used my water soluble marking pen to draw one row of scallops, then I would quilt that one row. Then I'd trace a second row and quilt that, and so on. It worked great! And was less time consuming than I expected it to be. Another bonus was that I didn't even have to switch out my presser foot to a walking foot. My regular foot worked just fine. And when the quilting was done, I sprayed the top with water to make the blue lines disappear! Here's a view of the quilting from the back - I love how it turned out! My finished mini is already up on the wall, brightening my sewing space with it's cheery scrappiness. (Spell checker is telling me that "scrappiness" isn't a real word, but I beg to differ.) Oh - and I get asked about how I hang my mini quilts - the secret is clear thumbtacks! Have you heard about the Spelling Bee book? It's another fantastic book by Lori Holt, jam packed with creativity. It starts with the block patterns for the entire alphabet - both upper case and lower case, all with options for small (4" x 6") blocks and large (8" x 12") blocks. 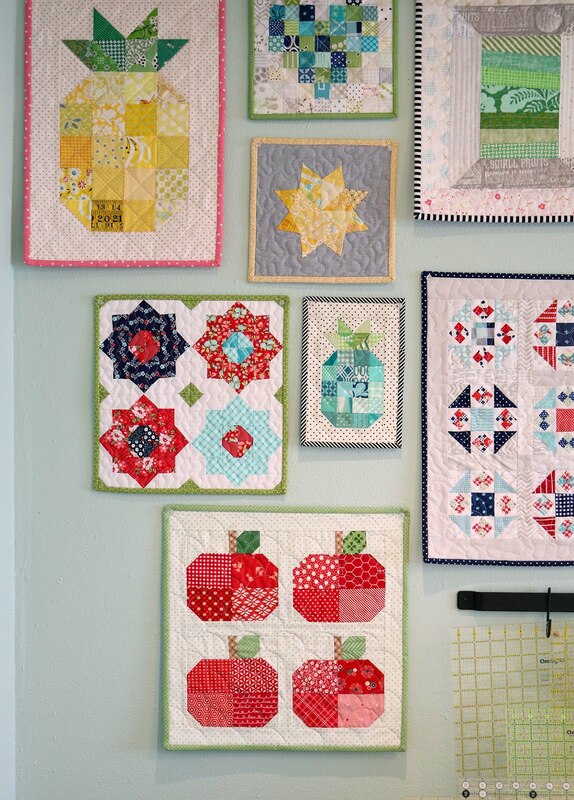 Then there are also picture blocks like the apples I made-- this quilt below shows a few more of them. The picture blocks also have the option for either 6" or 12" blocks. There are also number blocks (0-9), and punctuation blocks, and in the back are pages and pages of quilt ideas! 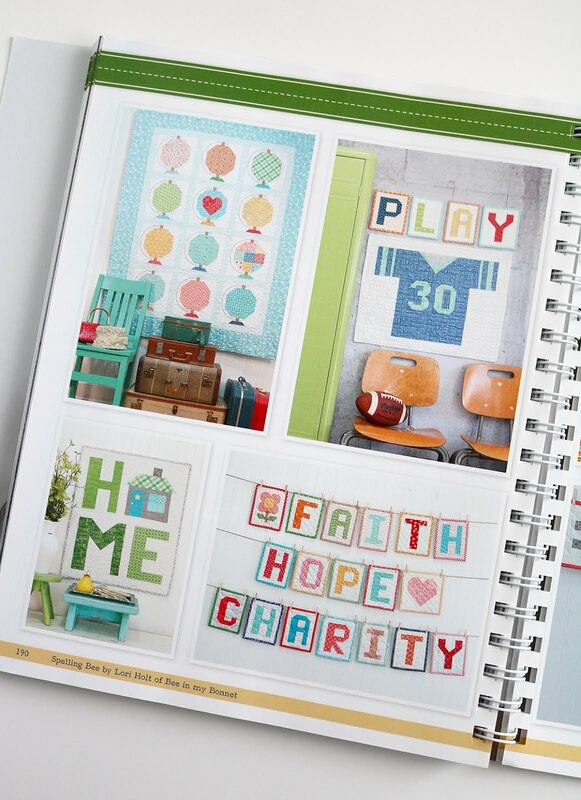 I've got my eye on the "Jack" quilt in the photo above, and the globe quilt below. 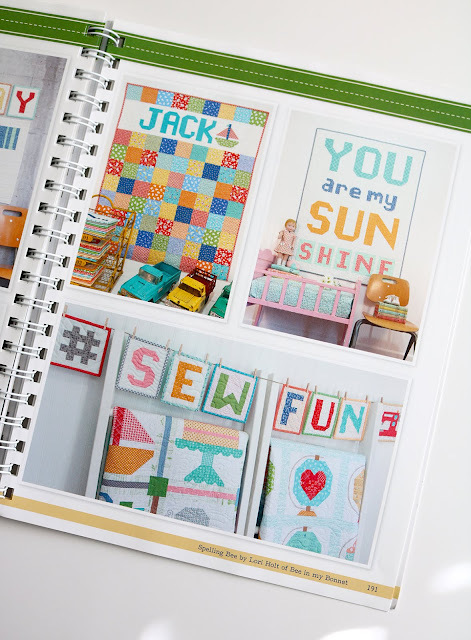 There are so many great quilt ideas in this book. And it's a great resource if you ever want to add a name, or other text to a quilt. 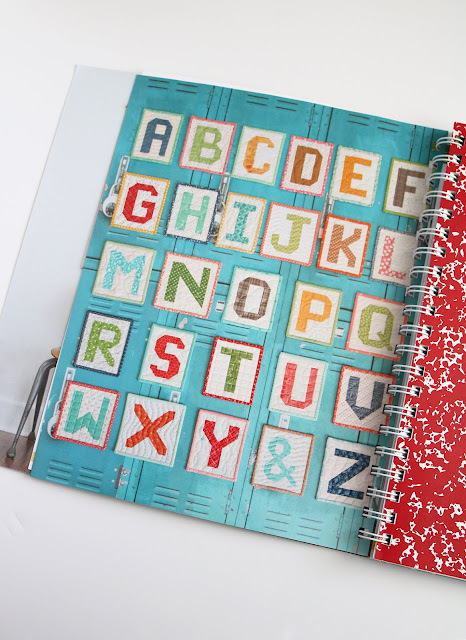 How cute would it be to add a child's name to the back of a quilt you've made for them? You can find the Spelling Bee book here at the Fat Quarter Shop. And right now the Fat Quarter Shop is hosting a Spelling Bee sew along. 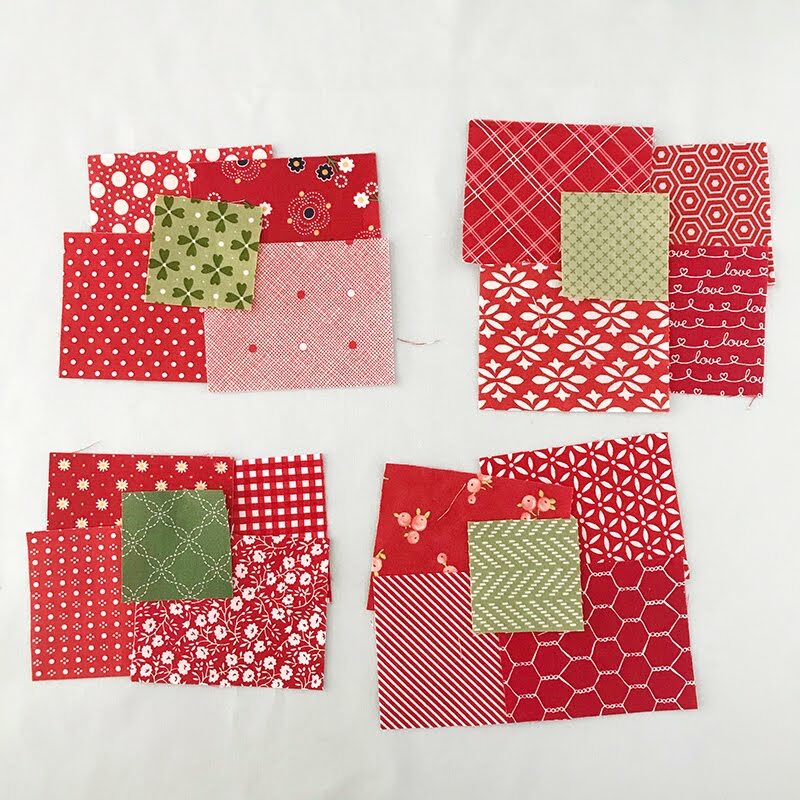 On Saturday each week a different blogger is sharing their version of one or two of the blocks in the book. My week to share is not for quite awhile but I couldn't help myself - I HAD to make those cute little apples! You can find the blocks they've already completed here. Darling apple mini! Clever way to do the clamshells, I shall have to remember that. It looks great with your other minis. 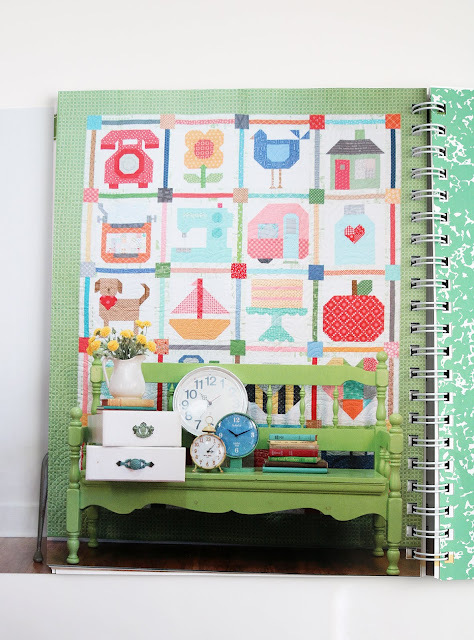 Darling mini to add to your lovely wall of quilty goodness! 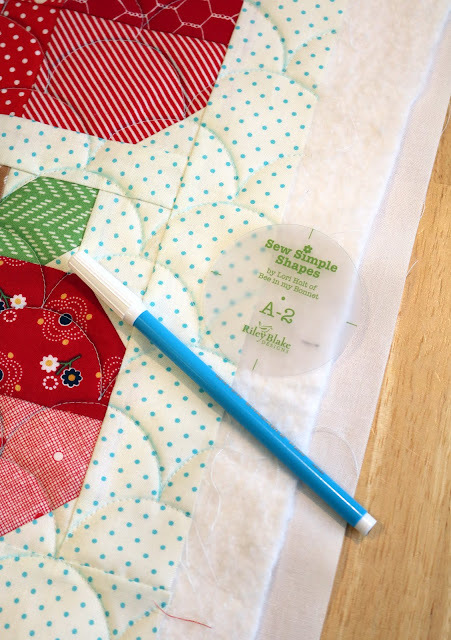 Your mini quilt is super sweet. I love the scrappy look of it and the quilting is just perfect. 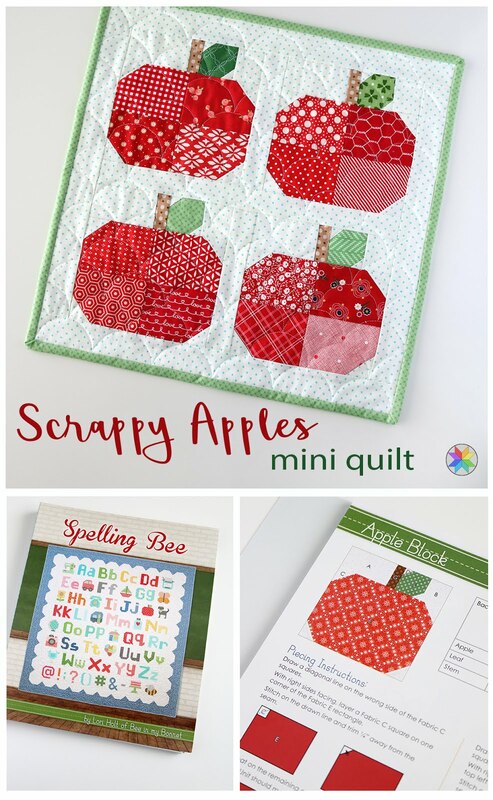 Love what you created - such a super cute apple mini quilt! Very sweet mini. I love the quilting! Thanks for sharing. How sweet, bet the children loved it too!! What a darling mini. Clear thumbtacks. Genius! I LOVE this mini Andy and am totally going to copy you! I also love the clamshell quilting and should give it a try as I need to add variety to how I quilt my minis (I'm currently stuck, yet in love with crosshatch quilting). Love it! I've been working my way through the alphabet with Lori every week. She makes some cute stuff.